﻿﻿﻿Generally, when I choose to recommend a website, I choose sites that are educational, or that provide information that people might find useful. Rides a Bike is neither educational nor particularly informational, but I just couldn't resist making it one of our featured web sites. 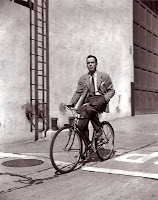 The blog is comprised exclusively of vintage photographs of classic movie stars riding bicycles. A simple concept that proves to be surprisingly charming and delightful. It's the only non-library themes blog that I include in my RSS subscriptions, and I always feel a tinge of happiness when a new post pops up.